WASHINGTON, DC, September 5, 2013 (ENS) – Safeway, the second largest U.S. grocery store chain, has agreed to pay a $600,000 civil penalty and implement a corporate-wide plan to reduce its emissions of ozone-depleting substances from refrigeration equipment at 659 of its stores in a settlement of alleged violations of the federal Clean Air Act. The settlement, estimated to cost approximately $4.1 million, involves the largest number of facilities to be brought into compliance under the Clean Air Act’s regulations governing refrigeration equipment. 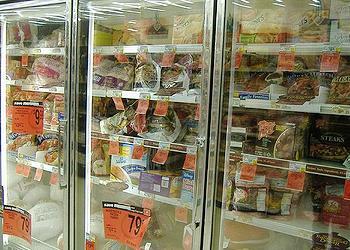 The settlement agreement resolves allegations by the U.S. Environmental Protection Agency and Justice Department that Safeway violated the Clean Air Act by failing to promptly repair leaks of the hydro-chlorofluorocarbon HCFC-22, a common refrigerant used by supermarkets that is a greenhouse gas and an ozone-depleting substance. The grocery chain also failed to keep adequate records of the servicing of its refrigeration equipment, the government agencies allege. EPA regulations issued under Title VI of the Clean Air Act require that owner or operators of commercial refrigeration equipment that contains over 50 pounds of ozone-depleting refrigerants, and that has an annual leak rate greater than 35 percent repair such leaks within 30 days. HCFC-22 is up to 1,800 times more potent than carbon dioxide in terms of global warming emissions. The measures that Safeway has committed to are expected to prevent over 100,000 pounds of future releases of ozone-depleting refrigerants that destroy the ozone layer. Safeway will now implement a corporate refrigerant compliance management system to comply with stratospheric ozone regulations. Under the settlement, Safeway has agreed to reduce its corporate-wide average leak rate from 25 percent in 2012 to 18 percent or below in 2015. The company will reduce the aggregate refrigerant emissions at its highest-emission stores by 10 percent each year for three years. “Safeway’s new corporate commitment to reduce air pollution and help protect the ozone layer is vital and significant,” said Cynthia Giles, assistant administrator for EPA’s Office of Enforcement and Compliance Assurance. “Fixing leaks, improving compliance and reducing emissions will make a real difference in protecting us from the dangers of ozone depletion, while reducing the impact on climate change,” said Giles. HCFCs deplete the stratospheric ozone layer, which allows dangerous amounts of cancer-causing ultraviolet rays from the sun to strike the Earth, leading to adverse health effects that include skin cancers, cataracts, and suppressed immune systems. Under the Montreal Protocol, an international treaty, the United States is implementing strict reductions of ozone-depleting refrigerants, including a production and import ban on HCFC-22 by 2020. The settlement is part of EPA’s national enforcement initiative to control harmful air pollution from the largest sources of emissions, including large grocery stores. EPA’s GreenChill Partnership Program works with food retailers to reduce refrigerant emissions and decrease their impact on the ozone layer and climate change by transitioning to environmentally friendlier refrigerants, using less refrigerant and eliminating leaks, and adopting green refrigeration technologies and best environmental practices. Safeway, headquartered in Pleasanton, California has 1,412 stores in the United States and 2012 revenues of $44.2 billion. Safeway operates companies under the banner of Vons in southern California and Nevada, Randalls in Texas, and Carrs in Alaska. The settlement was lodged Wednesday in the U.S. District Court for the Northern District of California, and is subject to a 30-day public comment period and final court approval. It will be available for viewing at www.justice.gov/enrd/Consent_Decrees. Established in 1986, A-Gas Americas (Formerly RemTec International) offers products and services that reduce ozone depletion and global warming. Our primary mission is to buy used CFCs, HCFCs, HFCs and Halons and reclaim them to industry standards. All CFCs, HCFCs, HFCs and Halons are banked and then offered for sale to our customers with full laboratory certifications. Refrigerants such as R-11, R-12, R-22, R-134a and the 400 and 500 series blends and Halon 1211, Halon 1301 and Halon 2402 are high in ozone depleting potential (ODP), or are high in global warming potential (GWP). All of these halocarbons pose a threat to our environment, and are a major global concern. A-Gas Americas maintains our commitment to environ-mental protection through innovative reclamation of these chemicals.